OK, I have a very specific question about this image. This is an image that I didn't like but, I decided to play with it in LR and really tweaked it as a B&W and have something I kind of do like. The photo was over exposed but, when I applied a gradient, lo and behold the clouds turned out to be less than boring. My question, how much of the foreground should I keep? I like the little bush but I don't feel like it "pops" enough to truly anchor the foreground. Then again, since I really want the image to be about the lighting relationship between the clouds and the crater, does it anchor it enough? What could I do to increase the "pop" of that bush? Last edited by deaner1971 on Mon Jan 23, 2012 9:20 am, edited 1 time in total. OK, reassessed the picture and am back to not liking it but I do still want to know what people would do (post-prod) to work on that foreground. This picture was never going to work too well and I was shooting it late morning and it was too hot a light and probably a bad time of year on top of that. Also, this was a trip with my wife where I was balancing her enjoyment with my photographic needs (and frankly my own desire to not miss out on the experience by spending all of it behind a viewfinder) so my composition is what I could get without too much time invested. I think my newfound like for the picture was more pride in salvaging an interesting sky with my new tools than in taking a detatched view of the image. The tweaks I used here will bear fruit on another, more salvageable picture later so, still good experience. Hi Dean: Thanks for posting another one. I do like the "drama" created by the light here. I am not sure I agree that is image isn't ever going to work. I do see some "critique" items worth mentioning, though. I think there may be 2 different crops from the bottom that could work. One would be to exclude the FG bush entirely, leaving the other small bush to the left middle FG in place. This might involve cloning out some of the top of the FG bush. I like the image. I have never been much of a B&W shooter -- I like it when it is well done. I am not sure I have the "vision" to get it right. I know there are lots of adjustments and filters that can increase drama in a B&W image, if you have the artistic vision and patience to work with it. Dean, I think you have to ask yourself this question: "What is the subject of the photo?" If the subject is the dramatic sky, crop so that the sky is presented in the best way possible. 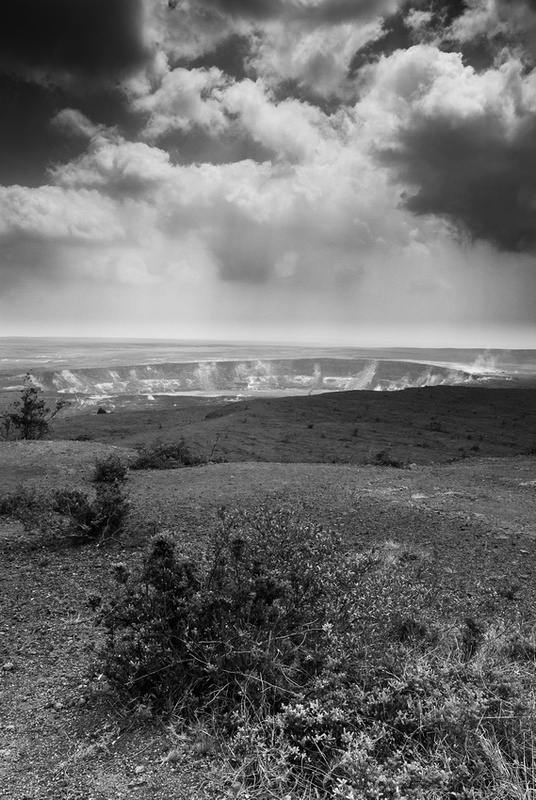 If it is the crater, or whatever it is, crop in a way that enhances that as the subject. I like Andy's crop but I would be inclined to crop it even further from the bottom so that it focuses on this pool, hot spring or whatever it is, as the source of the drama in the sky. Like Andy, I'm not a big B&W shooter but I like the idea that this caldron is brewing up a fantastic sky. I like that story a lot and I think I would really like the photo that tells it. I don't think this is a throw away at all, I think it is very special. I think there are some really great aspects to this image...quite wonderful...definitely wouldn't toss. I made a sample but couldn't upload attachment?!? I would crop a little over a 1/4 of the bottom off...just so it clips off the big bush. I did a bit of dodging and burning with loc. adjust brush...burned the middle dark slope on the right some...and at other places here and there to bring out some drama...even in the clouds I also moved the bush on the middle left nearest the frame...even further left so it creates a diagonal line with other bushes point toward center. You might try some of the b&w presets or duotone option in LR...you might get an interesting result from this.